President Donald Trump's border wall prototypes stand near the U.S.-Mexico border on July 16, 2018, in San Diego. (CNN) - Justice Department attorneys are continuing to work on cases to seize land from property owners along the US-Mexico border, despite other cases being put on hold until the government reopens. A case to acquire nearly 5 acres of private land in the Southern District of Texas for the purpose of erecting fencing proceeded this week. The court transcript, dated January 15, reveals how some federal attorneys are moving forward amid the shutdown. The judge in the case, Micaela Alvarez, acknowledged the shutdown in her opening remarks. "In light of the fact that even with the shut down, I understand that the attorneys handling these matters on behalf of the Government are not being furloughed and they still have to appear—I wanted to get these cases disposed of as quickly as possible, one way or the other," she said. "This is all I'm allowed to work on, Your Honor," said Assistant US Attorney Eric Paxton Warner. According to Justice Department guidance, in the event of a lapse in appropriations, civil litigation -- which these cases fall under -- "will be curtailed or postponed to the extent that this can be done without compromising to a significant degree the safety of human life or the protection of property." A spokeswoman for the US Attorney's Office Southern District of Texas said, "It is within the discretion of the US Attorney to determine excepted or non-excepted duties." She added, "In collaboration and agreement of the Department of Justice, US Attorney Patrick deemed that the ongoing border fence litigation, among other matters, were excepted and will continue to be as long as the federal courts are open." Asset forfeiture litigators and affirmative civil litigators, for example, also continue to work. Some prosecutors are funded separately and not affected by the lapse in funding. There are at least "six or seven attorneys" for the government working exclusively on fencing cases, according to the court transcript. Alvarez referred to them as the "golden children," likely because of President Donald Trump's focus on erecting additional barriers along the southern border. But these cases aren't directly pegged to the President's signature wall. They have been ongoing for years. In 2006, President George W. Bush signed the Secure Fence Act, authorizing some 700 miles of fencing along the US-Mexico border. While some of that land was owned by the government, other areas weren't. The government needed to acquire private property to build on the land, kicking off a slew of lawsuits. Approximately 80 cases are still outstanding, according to the Justice Department. Tuesday's land condemnation case dates to 2008. It involves defendant Pamela Rivas, who the government says is the "only party left in this cases to settle with" after at least a year of negotiations. Another family that also owned some of the land settled. Warner said the government wants to build an "18-foot fence" on the land, according to the court transcript. "We can't build wall right there," Warner said. "There's no levee that runs through Los Ebanos, so it won't look like the rest of Hidalgo County where we take half the levee and dump it on the north side and build a wall." The land is slotted for fencing in 2019 "if there is any money in the fiscal year," according to Warner. 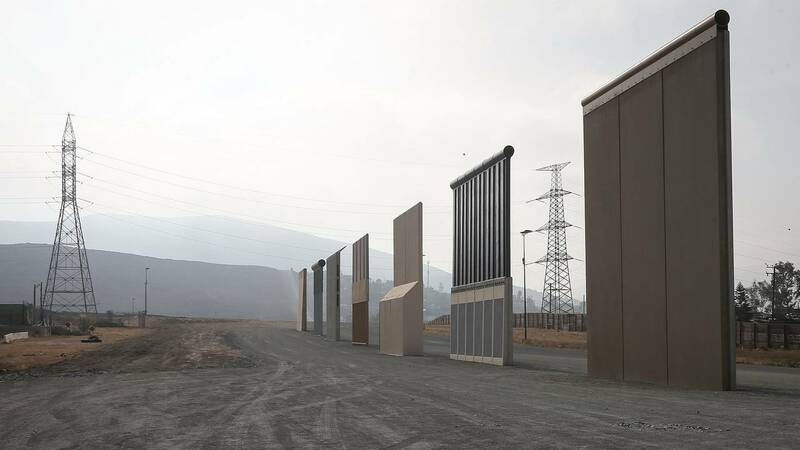 Regardless of whether funds are available, the government is pressing forward, indicating the significance of these cases in a heated debate over the border wall. The Justice Department also appears to be preparing for additional lawsuits in the area in the future: The department listed job postings for attorneys. Qualifications include "litigation of land condemnation cases." Customs and Border Protection has said it would consider eminent domain in the future. "It is always CBP's preference to acquire property through a voluntary, negotiated sale. The Government will attempt to negotiate an offer to sell using survey data and value estimates gleaned from the surveying process," reads an excerpt in a border wall Q&A on their site. "The Government will attempt to negotiate an offer to sell before moving forward with exercising eminent domain. However, if the Government and landowner are unable to reach a negotiated sale or if the Government is unable to obtain clean title, the Government will need to file an eminent domain action." For now, however, the federal attorneys in southern Texas intend to continue their work on the cases at hand. "We continue to work alongside our law enforcement partners from FBI, DEA, ATF, DHS, USMS and numerous others who are charged with conducting enforcement operations and advancing significant investigations," said US Attorney Ryan Patrick in a statement. "Our work is not impacted by the shutdown. It is essential to public safety."